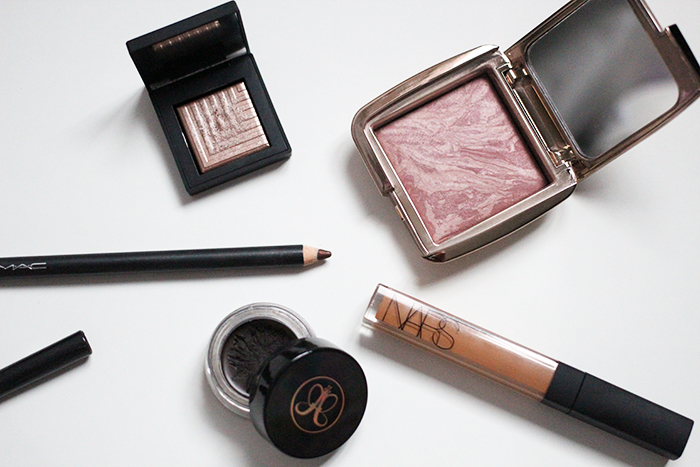 The Early-Class Makeup Edit – amandarobots. I’ve found myself in a bit of a makeup rut lately, largely because I usually do my makeup around 7:30 every morning. I’m so not a morning person that I usually don’t feel particularly creative or adventurous. In an attempt to break out of this rut, I’m going to pay homage to the products I’ve been loving for quick, early-morning makeup and then – hopefully – move on and try some different things. Virtually the only shadow I’ve been wearing is Nars Dual-Intensity Eyeshadow in Himalia. It’s unbelievably flattering and soft, which makes it easy to blend and wear. The shade makes my tired eyes look bright and awake, something I’m very much in need of these days! MAC Teddy Eye Kohl is so easy to wear – it’s a bronze shade with a little bit of shimmer that looks way softer and less done-up than a black liner. The easy-product train stops with Anastasia DipBrow Pomade. This product is by no means easy to use – in fact, it’s the most time-consuming step in my routine. It’s very fiddly and very easy to mess up, so much so that it makes me a little nervous every time, like doing winged eyeliner. But once I power through it, this stuff gives me some of the best brows of my life – if, like me, you don’t have much natural brow goin’ on, this is definitely worth trying. Nars Radiant Creamy Concealer is my absolute favourite concealer. Ever. Hands down. I would always prefer spot concealing where I need it over covering my face with foundation. This way, my natural skin can shine through, and the Nars concealer is most similar in texture to my skin. I use it on spots, under my eyes, and to highlight the high parts of my face. The biggest surprise for me is Hourglass Ambient Lighting Blush in Mood Exposure. At first glance, I thought this shade would be too pale to show up on my skin, but it’s actually a lovely plummy-pink that’s buildable or can be sheered out. Its brown undertones make for a very neutral and versatile blush, which is probably why it’s been my default for the past month or so!